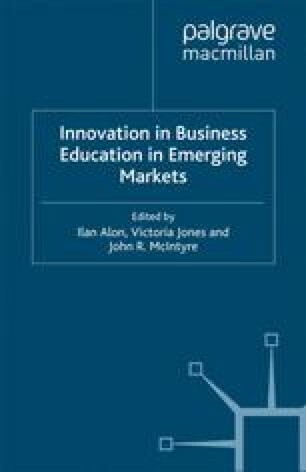 The rise of modernizing universities in emerging market economies (Marginson, Kaur and Sawir, 2011) inevitably puts them on the road to globalization and transnational education. As defined by GATE (1997), transnational education [TNE] relates to “educational services (includ- ing those of distance education) in which the learners are located in a country different from the one where the awarding institution is based.” To the present time, TNE has been largely a privilege of educa- tional institutions representing the developed world, but this may well change in near future creating a reverse trend that can be labeled as “reverse transnationalization.” Reverse transnationalization is conceptualized here as a TNE project in which learners located in a developed country are enrolled in a program conducted by an institution located in an emerging market country. The project reported in this chapter provides a rare example of reverse transnationalization.